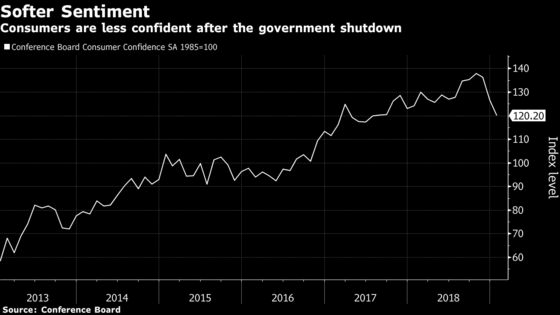 (Bloomberg) -- U.S. consumer confidence slumped in January to the weakest level since July 2017 as optimism on the economy soured during the longest-ever U.S. government shutdown. The confidence index fell to 120.2 from 126.6, the New York-based Conference Board said in a report Tuesday. That missed economist estimates in a Bloomberg survey calling for a drop to 124. The measure gauging consumer expectations slumped to the lowest since October 2016 while Americans’ views on present conditions weakened for a second month. Though confidence recently reached an 18-year high, the index has slipped amid the five-week government shutdown, continuing trade tensions with China, and major swings in U.S. stocks. During the last major shutdown, in October 2013, confidence fell 7.8 points to 72.4. The January decline in consumer confidence should be interpreted as more noise than signal due to the spike in political uncertainty stemming from the government shutdown. The elevated -- and relatively unchanged -- level in the present conditions index indicates that the economic expansion remains on solid footing. Read more for the full reaction note. On the bright side, the share of consumers planning to buy a home within six months jumped to 7.8 percent, a record in data back to 1967, as mortgage rates declined. The share expecting business conditions to be worse in six months was the largest since November 2013, just after the last lengthy government shutdown. The labor differential -- which measures the gap between respondents saying jobs are plentiful and those who say they’re hard to get -- held near the highest level in almost 18 years, a sign the labor market remains strong. Buying plans showed mixed responses. The measure of consumers planning to purchase a car within six months held up, while the share expecting to purchase major appliances fell to an 18-month low.